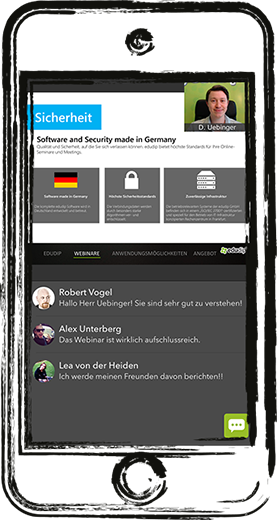 The app allows participants to participate in webinars via mobile phone or tablet simply and uncomplicated from on the way. Just download the app for free at the App Store for your iPhone / iPad or at the Play Store for your Android device. Booked webinars can be called after the Login directly about the homepage of the app or about an invitation link by e-mail. The chat allows the participant to communicate with the moderator and other participants during the webinar. The media mix of PowerPoint slides, YouTube videos and polls provides an exciting and varied webinar experience. from the way or simply on the couch. From the app's homepage or the link in the e-mail you can simply call up your booked webinars and participate. Use the chat to communicate with other participants or focus entirely on the trainer in the moderator view. Watch your booked videos in the app - also available in an offline mode.